A wild boar is seen at a residential area in an evacuation zone near Tokyo Electric Power Co's tsunami-crippled Fukushima Daiichi nuclear power plant in Namie town, Fukushima prefecture, Japan, March 1, 2017. The ongoing scourge of Japan’s Fukushima — radiation — is now roaming the disaster-hit area on four legs. Hundreds of radioactive wild boars moved into deserted towns after the nuclear crisis. Now they scour the empty streets and overgrown backyards of the Namie town for food, an unexpected nuisance for those returning home six years after the meltdown. Namie and another town, Tomioka, are within the 20 kilometer exclusion zone from the Fukushima plant and set to partly reopen for nuclear refugees this month. But the boars have been known to attack people. 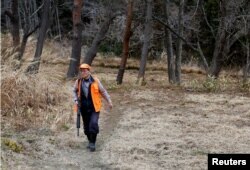 Local authorities are hiring teams of hunters to clear out the uninvited guests. Since last April 300 animals have reportedly been caught just in Tomioka. The boars have been destroying local farms and eating plants contaminated with radiation. Some of the boars tested by the government showed levels of radioactive material 130 times above Japan’s safety standards. Five towns in Fukushima have partially reopened since the disaster so far. But three weeks before the evacuation order is to be lifted in Tomioka, the average radiation level is still well above Japan’s goal. Homes are still damaged or abandoned, and the streets are littered with bags of radioactive waste.